In histopathology, characteristics of nucleus and cytoplasm often give diagnostic clues. While some features are suggestive of a particular lesion, others are indispensable and are pathognomonic. 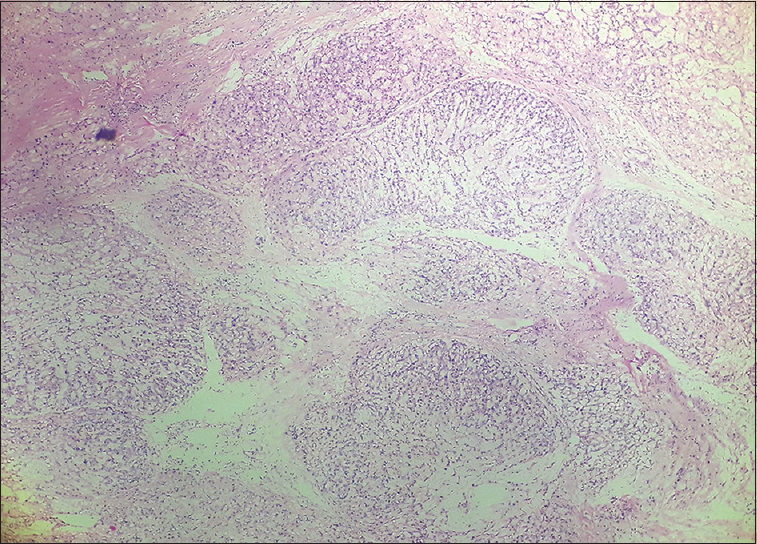 Here, we would like to discuss “physaliphorous or physaliferous cells,” characteristic cells (if not pathognomonic) seen in chordoma which is a rare malignant tumor derived from the embryonic notochordal remnants. In the head-and-neck region, clivus is the most commonly involved site with a male predominance. Physaliphorous is a combination of two words – Greek word Physallis meaning “bubble” and Phoros meaning “bearing.” Thus, physaliphorous cells literally mean cells having bubbly or vacuolated appearance. [Figure 1] shows hematoxylin and eosin photomicrograph of sheets of the large polygonal cells with distinct cell outline, clear or vacuolated eosinophilic cytoplasm and small round central or eccentric open-face nuclei. 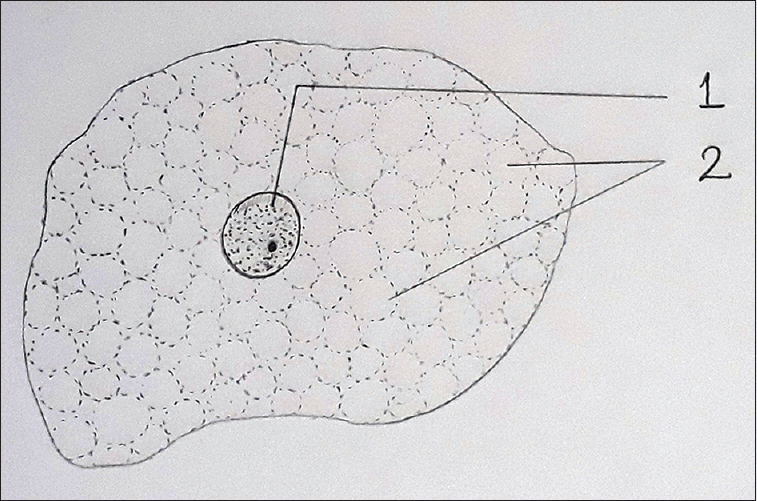 Hand-drawn image of a physaliphorous cell is demonstrated in [Figure 2]. Typically, these cells are seen in the cords or lobules separated by the thin fibrocellular septa [Figure 3]. Variable amount of nuclear pleomorphism may be seen. 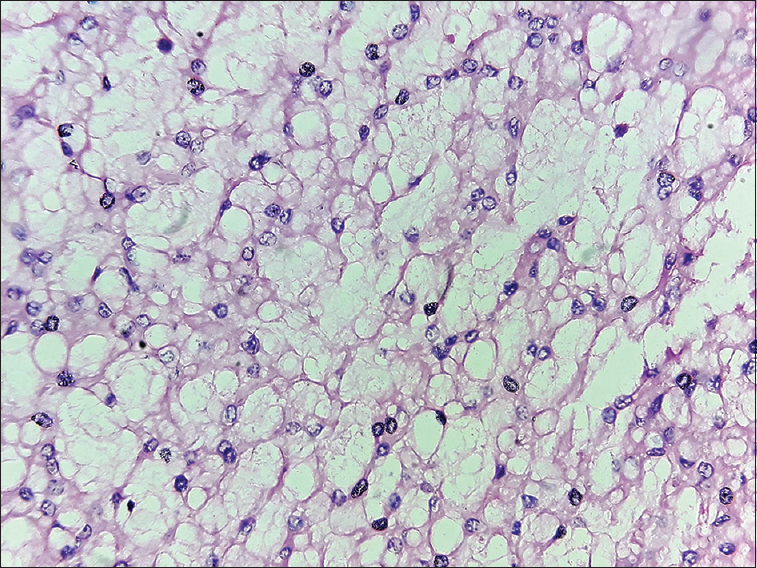 Chondroid chordoma is a term given where hyaline cartilage-like matrix is found in between the lobules of “physaliphorous cells.” Other variants include dedifferentiated chordoma consisting of areas of undifferentiated sarcoma with classic type. The exact nature of these cells is not clearly understood. The vacuolated structure of the physaliphorous cells corresponds to the structure of the notochord consisting of large chordocytes with prominent vacuoles. Ultrastructurally, two types of vacuoles have been described, namely, villous vacuoles and smooth-walled vacuoles. Another early electron microscopic study showed that small vacuoles represent dilated cisterns of the coarse endoplasmic reticulum, while the large ones are derived from sequestrations of the interstitial material. The size of the physaliphorous cells can reach up to 50 μs or more. 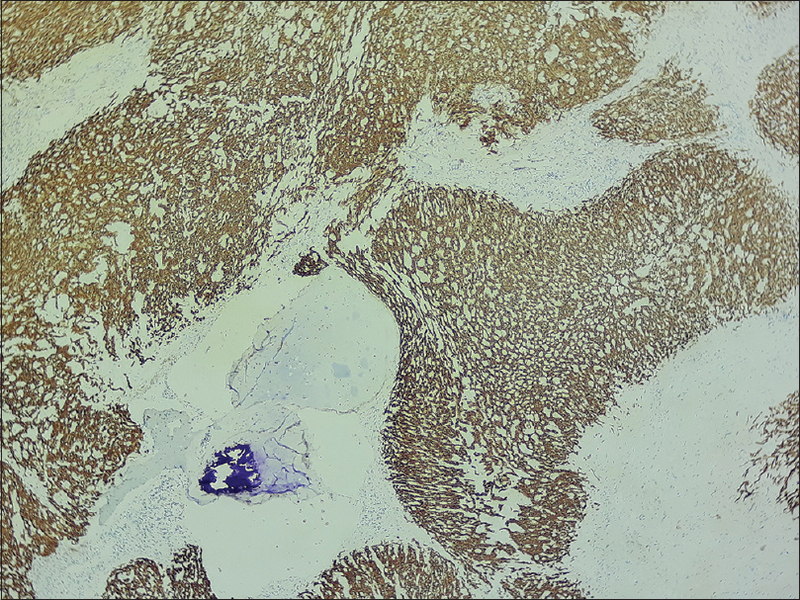 These cells show immunohistochemical expression of pan-cytokeratin [Figure 4], EMA, S100 and brachyury. It was previously believed that the large vacuoles store sulfated glycosaminoglycans; Lam R, in contrast, showed that these vacuoles form as a result of breakdown and utilization of membrane-bound glycogen in the biosynthesis of sulfated glycosaminoglycans. Apart from the skull base, sacrum and spine are other most commonly affected sites. T (brachyury) gene duplication is shown in rare cases of familial chordoma. Complete surgical resection of the tumor is the most important prognostic factor. Gui X, Siddiqui NH, Guo M. Physaliphorous cells in chordoma. Arch Pathol Lab Med 2004;128:1457-8. Friedmann I, Harrison DF, Bird ES. The fine structure of chordoma with particular reference to the physaliphorous cell. J Clin Pathol 1962;15:116-25. Peña CE, Horvat BL, Fisher ER. The ultrastructure of chordoma. Am J Clin Pathol 1970;53:544-51. Lam R. The nature of cytoplasmic vacuoles in chordoma cells. A correlative enzyme and electron microscopic histochemical study. Pathol Res Pract 1990;186:642-50. Yang XR, Ng D, Alcorta DA, Liebsch NJ, Sheridan E, Li S, et al. T(brachyury) gene duplication confers major susceptibility to familial chordoma. Nat Genet 2009;41:1176-8.